What makes top Supreme Court judges expressing dissatisfaction with procedures, including how vital cases are being allocated, a key moment. Can the four judges’ complaint be called a ‘crisis’? It is certainly an unprecedented situation. It involves sitting judges speaking out. Judges have spoken before, but mostly off the record, or while hearing cases. Justice JS Verma spoke in the late nineties on things ailing the judiciary. But that was in general terms. Recently, Justice CS Karnan, a sitting High Court judge, went public and even sentenced Supreme Court judges to jail, for, in his view, violating the SC/ST (Prevention of) Atrocities Act. Justice Kehar was the Chief Justice. Karnan acted alone. He ended up being the first sitting judge to be held guilty of contempt and jailed. What makes this complaint from four senior-most judges different is that it doesn’t involve a single judge. This is the entire Collegium, minus the Chief Justice, airing differences. These judges are not a group, with similar ideas on how the judiciary must function. One is the putative successor after the present Chief Justice demits office. What is the meaning of ‘business as usual’ in court, which senior legal officials hope will be achieved? ‘Business as usual’ is in some sense restored with courts functioning and judges hearing cases rostered to them (even after they have publicly shared concern that the rostering of work is unfair). But the other big administrative task, which the Chief Justice fulfills, is discharged as a group — a Collegium — which is responsible for judicial appointments. The letter released last Friday was written by four out of five members of the Collegium, so the Chief Justice is unlikely to have an easy run there. What is the meaning of ‘resolving the situation’? A resolution would have to involve some discussion between all five judges, leading to a settlement on what the rules of the game must be. Some rules for ‘rostering’ may be in order. Rostering cannot be seen to necessarily exclude seniors. In India, given the scale of cases, the principle of en banc or the entire court hearing everything together does not apply. The Indian Supreme Court speaks in many voices (26 judges in 13 court rooms). But Benches seen to be ‘specialising’ in some area could be created, so the allocation of cases is not seen as purely discretionary. 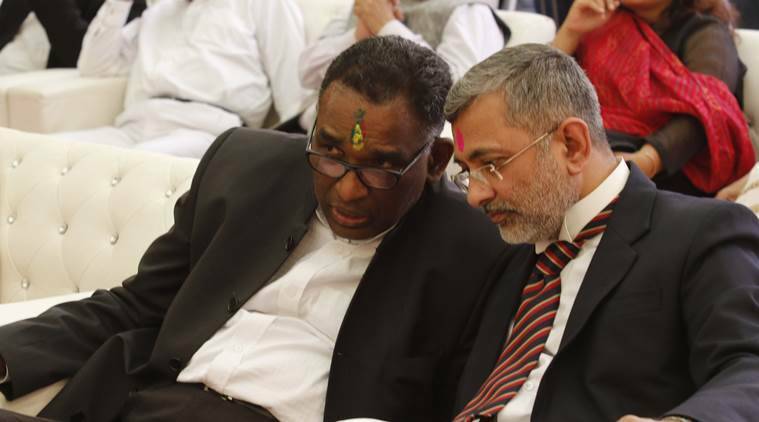 The one case in which a complaint was made against the Chief Justice, the Medical Council of India bribery scam, was re-allocated to himself on the bench by the Chief Justice on November 10, 2017, despite being allocated to another bench (consisting of five senior-most judges of the Supreme Court) by Justice Chelameswar, the second-most senior judge. The principle of nemo judex in causa sua or ‘no man can be a judge in his own case’ was held to be overruled by the other principle of the Chief Justice being the ‘master of the roster’. This may need changing if any meaningful resolution is sought. Has anything happened historically which has similarly drawn the judiciary into a national debate? The most contentious time was in the 1970s, when the idea of the ‘committed judiciary’ that Indira Gandhi and her team spoke of, was almost secured. The infamous ‘ADM Jabalpur vs Shivkant Shukla’ case (April 28, 1976), which essentially upheld the government’s right to limit the fundamental rights of Indians in an Emergency, had a sole dissenter — Justice HR Khanna, who was penalised for his view. The appointment of Justice AN Ray, as Chief Justice in April, 1973, superseding three senior judges, is meant to be an all-time low in how the judiciary was sought to be managed. His proximity to then-PM Indira Gandhi raised serious questions over the judiciary’s role in the Emergency. Later, the judiciary, in an era of coalition governments, took on a role deemed more ‘activist’, also evolving a unique mechanism of securing near-complete control over judicial appointments. The government retains administrative control, but especially after the NJAC Bill was struck down by the Supreme Court in 2015 (Justice Chelameswar being the lone dissenter), appointments again fall in the judiciary’s domain. What is the relationship of the judiciary with the executive and Parliament? The relationship between the three pillars of Indian democracy has often been fraught — a see-saw, but that itself is said to add heft to Indian democracy. If the Rajya Sabha is seen to balance the Lok Sabha, then the judiciary has applied brakes on legislative enthusiasm, beaten back sometimes, yet persisting. At the very start, when the Constitution was drawn up in 1950, judges ruled on two crucial matters — supporting the rights of zamindars and the right of journalists to publish (Romesh Thapar versus State of Madras, 1950). Then, the government sought to bring in the first ever amendment to the Constitution. Also, the only way a judge can be removed from office involves Parliament. Justice Soumitra Sen is the only judge to have been impeached by the Rajya Sabha in 2011 — he resigned before the Lok Sabha could vote on the matter. The fact that the removal of a judge is only possible via Parliament adds ‘balance’, but also a slice of tension to the relationship. The famous Kesavanand Bharti judgement in April, 1973, gave India the ‘basic structure’ or parameters for the legislature to amend the Constitution. Nothing that seeks to change the ‘basic structure’ or spirit of the Indian Constitution would be allowed, said a thirteen-judge bench led by Justice Sikri. Governments and courts have had issues as the state is the biggest litigator. Court judgements impact policy, but cases often have political implications and so, policy and politics and courts continue to be intertwined.